When it comes to road trips to wine country, Mexico is not the first thing that comes to mind. This is also why it’s a great place to go. Sometimes referred to as “Napa Valley 30 years ago,” the Valle de Guadalupe is still growing into becoming an American tourist destination. The scenery is breathtaking. The wine is delicious, star chefs are showing off their talent and yet it is all so cheap. At only three-and-a-half hours away, the Valle is an easy road trip. OK, it can take up to five if there’s traffic, and crossing the border on the way back can be lengthy. But it’s a scenic drive and shorter than the one to Sonoma. There’s also the option of taking the Amtrak Surfliner to San Diego and getting a rental or a driver from there. 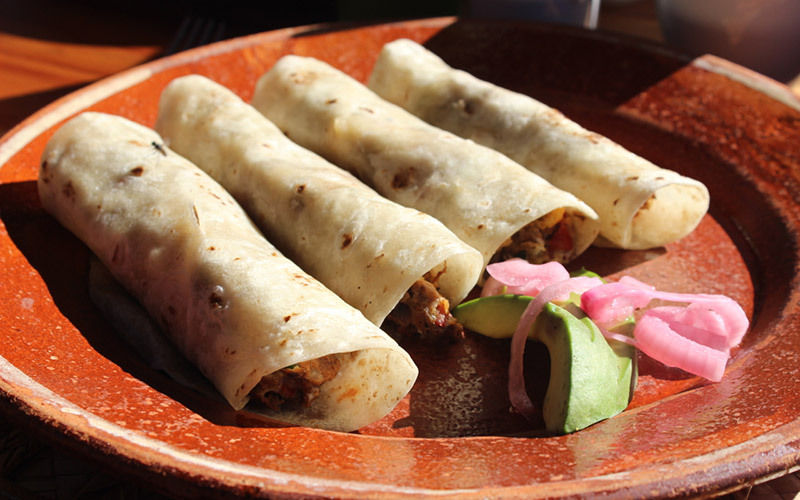 A stop in Tijuana for street tacos or brunch at organic juice and breakfast spot Alma Verde is a nice way to break up the trip. 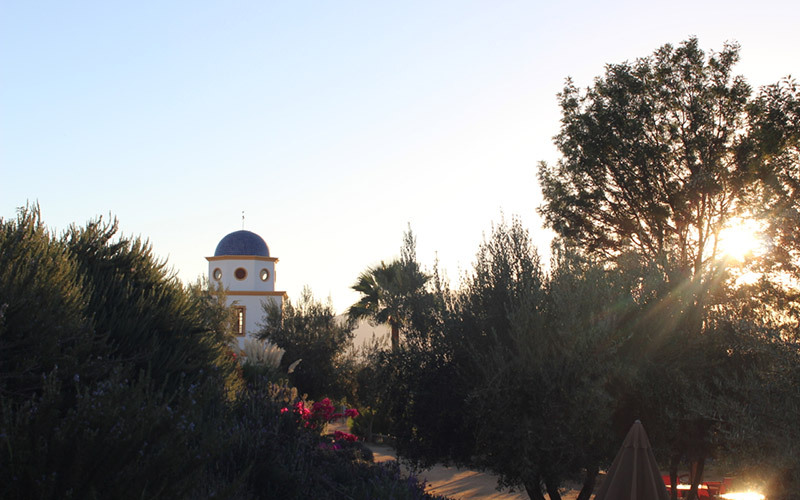 Wake up at Adobe Guadalupe Winery and eat breakfast at a long communal table inside of the Spanish-style inn’s kitchen. Spend the morning riding horses, tasting wine or getting a massage. For camping there’s Cuatrocuatros resort where visitors have the option of staying inside of an elevated tent nestled in a sprawling seaside vineyard. 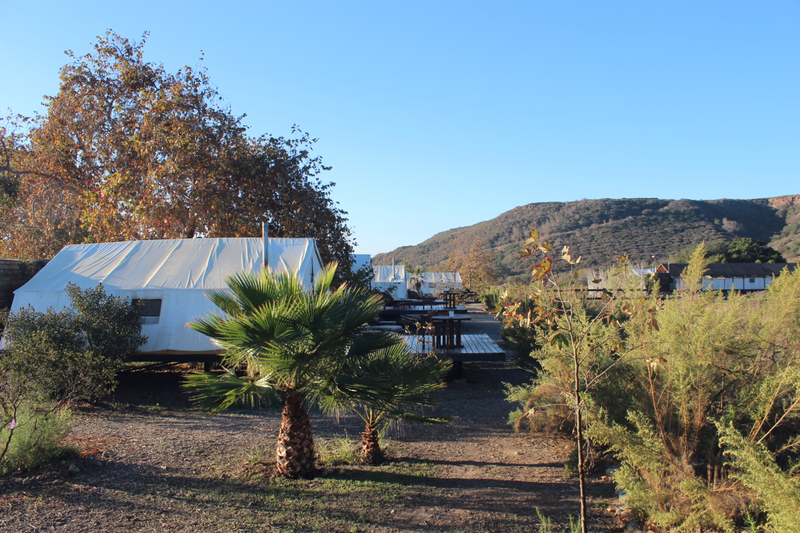 The luxury camping resort outside of Ensenada supplies heat and electricity-equipped tents. Each one is outfitted with a walkie-talkie for last minute “Please help me light my wood stove” requests. Wake up amid nature and walk to the breakfast tent for fresh squeezed green juice, huevos rancheros and breakfast burritos. Where there is delicious wine, there is delicious food. For lunch head to celebrity chef Javier Plascencia’s eatery Finca Altozano. Cucumber-mint agua fresca, octopus with soy and cilantro, quail with pinto beans and wood-fried lamb tacos are recommended . The rustic outdoor setting where Finca Altozano sits also includes giant wine barrels that guests can climb inside, perch on top of, and enjoy the view. 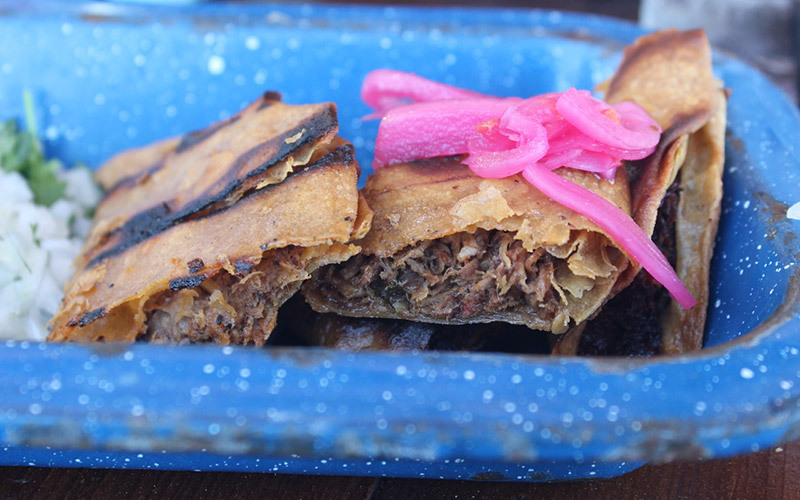 Another must-visit is TrasLomita. The restaurant at Lomita Winery is nestled amid the vineyard in a sort of magical hidden garden. 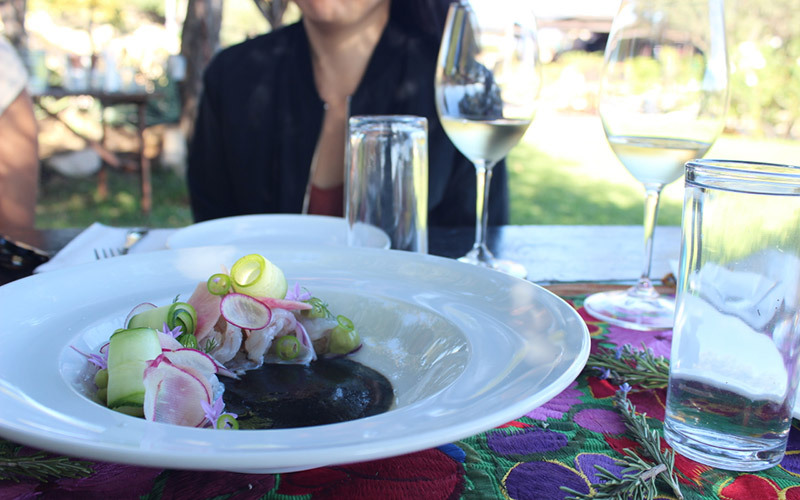 Young, talented chef Sheyla Alvarado carries out dishes like grilled asparagus with house made requesón (housemade ricotta), roasted almonds with nasturtium leaves and aguachile that looks like a bouquet of marinated shrimp, radishes cucumber and herbs. Eat dinner on-site and sleep in a pod at Mexico’s most-talked-about hotel. Encuentro Guadalupe is where Rihanna stays while visiting the region. It’s pricey, but still less expensive than a weekend in any of the other California wine regions. 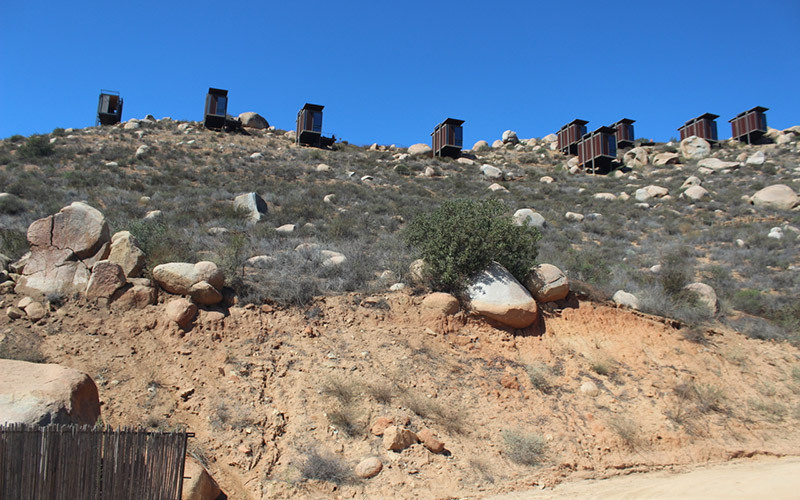 Unlike most destination resorts in Mexico, Encuentro Guadalupe incorporates you into the natural surroundings, rather than shielding you from them. For this reason the mountainside winery and retreat refers to itself as an “Anti-resort.” To get to your room you must be driven up the mountain in a van. The ride borders on terrifying, but when you arrive at your individual private pod, it feels like you’re on another planet – one you don’t want to leave.